It's off to Europe for christmas and I intend on hunting down the odd train. 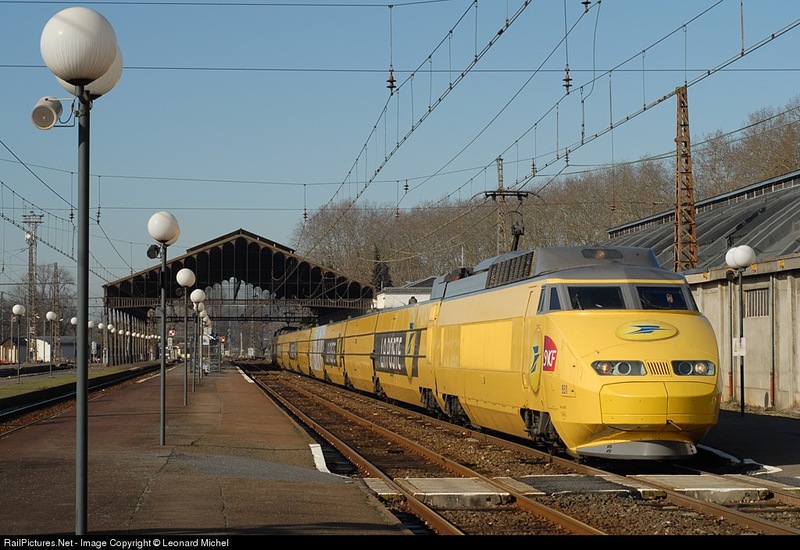 The first on the research list is reminiscent of Dr Yellow from Japan: TGV La Poste. This service is an express freight EMU (not unlike the M250 of Sagawa Transport) for the French Postal Service based on the TGV series. I'm going to use this page as a thinking-out-loud scratchpad to record the information I'm able to obtain. The goal is to grab a shot of it in action down the line and then one (at least) in the depot near Gare De Lyon in Paris. NOTE: It seems this effort will be futile... the sun won't rise until around 8am and the train is due to run only during the dark-hours. this link has the timings for 2015. Trains en Voyage : Gares et horaires du TGV La Poste? Bad news... will the service still be running in January 2015? More information in English on the service. Could be a bad translation... but looks like the service will run until at least mid-2015. Simtrain-FR : info TGV poste. From all of the above data, I've managed to scrape together the following timetable of the services. From the links, you can tell that this data is old... really old. I am under the impression that the service will be wound-down in 2015, but hope that one or two of the services below will be running in January. There's a double-up on times around Macon for most of the services. It seems that the train arrives at Macon-Loché, heads in to Macon-ville and then back out on it's way via Macon-Loché once more. This wasn't easy... I have no idea if the map to the left is the correct path... it seems that the train travels on the highspeed direct line in some places and then diverts to the local SNCF lines in others? From what I can tell, the train travels further south than Cavaillon. But all timetables only reference it to there. From the YouTube link at the start of this article, you can tell that the service seems to travel all the way to Nice? Or at least past Cavaillon? If anyone can help, I'd love to get this map correct for anyone else wanting the information. Based on the timings above, it's going to be really hard to see this thing in daylight, moving, whilst being based in Paris. My best bet will probably be to head down to the RER stations 'Maisons-Alfort Alfortville' or 'Le Vert de Maisons' early in the morning and hope for the best. It'll be mid-winter, so lighting will be low. I'll post again once executed.